I got a ride to the tournament from the 6 Prizes man himself, Adam. On the ride over, I finalized my deck-list (I’m always a last minute person), talked some Pokémon, and stared at the countryside scenery. And no trip would be complete without at least one missed turn, but that wasn’t really our fault, the street sign was off the post. I would be playing Magnezone at this tournament, a deck I’ve been playing on and off since Stormfront, while making changes along the way. 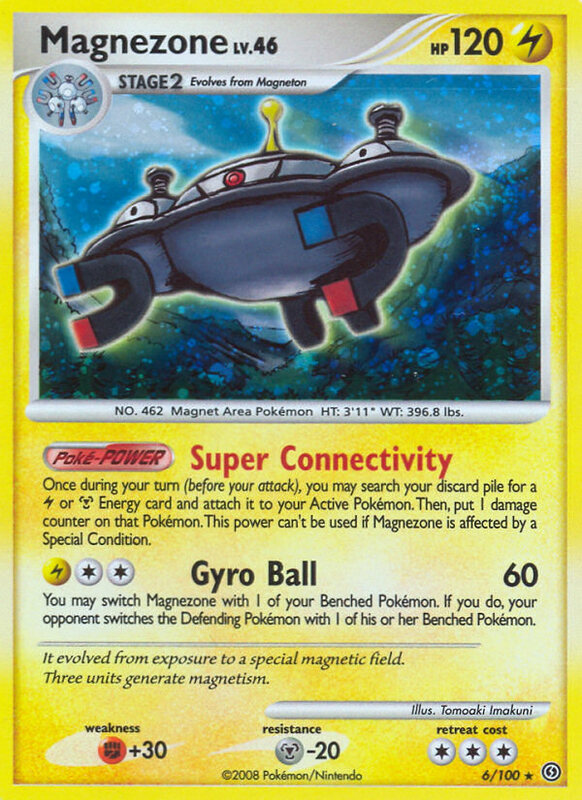 I’m not going to put a full deck-list up, but here are the main Pokémon and techs: Magnezone DP, both Magnezones in SF, Magnezone Lv.X, Electivire Lv.X, Spiritomb AR, Mr. Mime MT, and a tech I throw in the night before, Great Blissey HS. I haven’t had much practice facing SP, and I didn’t think I had the greatest match-up vs SP, so I had no idea how this game would turn out. We both had not the best starts, and just piled special metal energies onto our active Magnemite and Dialga G. I couldn’t do very much against his Dialga G with 3 special metals attached that he was also healing with Garchomp C Lv.X’s Healing Breathe. Every time I used Magnezone Lv.X’s Cyber Shock attack to paralyze him, he always had a switch or warp point to get out of it. I was down 4 prizes to 1, then I brought up Electivire Lv.X for a small comeback to get down to 2 prized, but he brought up Garchomp C Lv.X and sniped my benched Uxie with Dragon Rush for the win. I knew that I would be power locked a majority of the game, and since a lot of my deck revolves around powers, I had to find a way around this. I started out with Chansey, and ended up putting 2 energies on it to retreat to Spiritomb in order to set up. Like I expected, I was power locked most of the game, but I worked around this and stayed ahead on prizes. He had a Duskull on the bench, but he was never able to evolve it to Dusknoir which would have really messed me up due to my bench almost always being full. The game was a little slow, but I won it in the end. I had practices against my friend’s Gyarados deck before the tournament and was confident with my deck and the match-up. He had a very bad start to my decent start. We both stalled a while in the beginning, he with Sableye and I with Spiritomb, neither of us wanting to send out our main attackers, OK the other’s tech, and be hit hard the next turn. After seeing that he wasn’t going to budge, I pulled out a Magnezone and started attacking. Once I got my prized Mr. Mime, and was switching to his with Magnezone’s Gyro Ball attack, my opponent could not do anything because he wasn’t getting anything to send Mr. Mime back. He did end up getting some prizes by Flash Biting my bench, but I easily won this game. Now that I currently had a winning record, I was feeling more confident after the first round loss, but I didn’t know too much about the Gliscor deck other than it had a somewhat similar strategy to mine, so I was a little skeptical. After we both draw our opening hands and waiting for the match to start, my opponent looked up and said something along the lines of ‘if you have anything decent, you win’, and I responded with ‘nope, mine’s probably just as bad.’ We both flipped over, and my lone Azelf was facing his lone Unown (G or Q, I forget which one). On both of our first turns I think, we got our Spiritombs in play and retreated to them, and we both just used Darkness Grace for a while and set up. After the slow start, I quickly KOed a few of his Pokémon and got down to two prizes, but after that, he got his lock set up and I was completely helpless. I had nothing in my deck to deal with being paralyzed and facing an active Spiritomb. With the combination of the lock and being Bright Looked a few times, the rest of the match was one-sided, and he KOed my belted Magnezone for the win. I was relieved to see that I was playing another Gyarados because I would have to win the rest of my games to make top cut. We both set up very quickly, and everything was looking good until he pulled out his Dialga G Lv.X tech. This put a wrench in my strategy; not only did it stop my Mr. 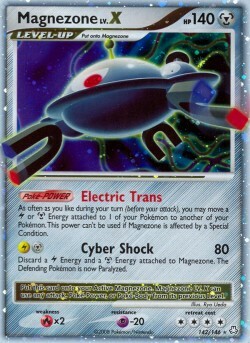 Mime tech, but it also stopped my Magnezone’s Magnetize body, so I wouldn’t have free retreat anymore. He countered my counter. One turn he dropped 2 Crobat Gs, Poké Turned 3 times, belted his Gyarados, and KOed my belted Magnezone Lv.X. I pulled up my Electivier, got 3 lightning energies and an Expert Belt on him and went for the risky Discharge play to turn the game around. I needed 2 of 3 flips to be heads in order to one-shot his belted Gyarados, but as always with my luck, I only got one head. Next turn I leveled up Electivire and managed a small comeback; he misplayed and played a stadium, allowing Electivire Lv.X to be invulnerable for two turns in a row. I got down to 2 prizes, and paralyzed his Gyarados, but he warp pointed out and used Tail Revenge for the win. I was bummed that I was now out of the top cup running, but I continued to play as if I still had a chance; I wanted to leave with a winning record. 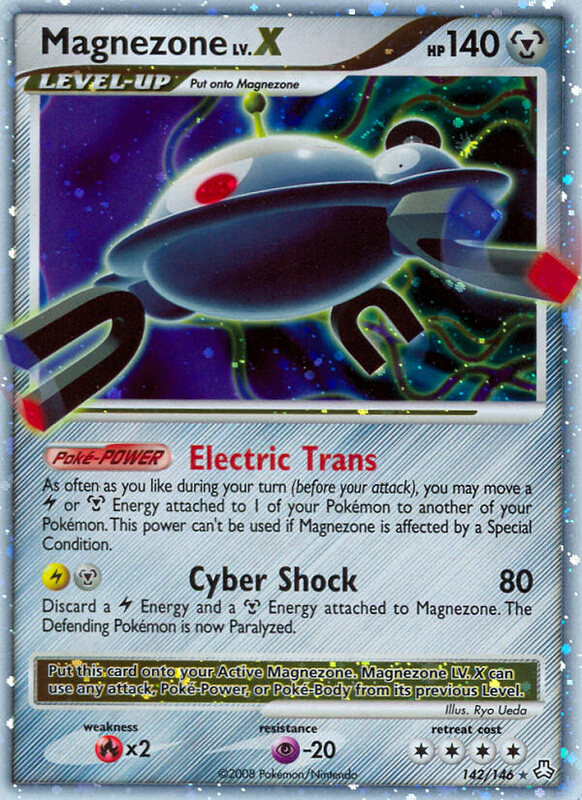 I had a really slow start due to the fact that my Magnezone with Magnetic Search and my Azelf were both prized, but my resistance to psychic and special metal energies greatly reduced the damage done to me, allowing me to stay right in the game. After I was able to level up to Magnezone Lv.X, I quickly took prizes, and avoided Fainting Spell by using Gyro Ball to switch with a benched Pokémon (I’m still not sure if that is the correct ruling on this play, but my opponent didn’t say anything about it so I’m not complaining. Can somebody tell me if this is the correct ruling on the play?). Anyway, after a long, drawn out battle, time was called; I was up 1 prize to 4, and took the game. This was it, the final round, my last chance to get that winning record that I wanted. We both started out absolutely horribly; he couldn’t get any Pokémon out, and I couldn’t get any energy out. He ended up having to attack with his Metapod tech, while I passed turn after turn waiting for a second energy so I could attach back. He started to get his Pokémon out when I started to get my energies, and the real battle begun. I had the upper hand pretty much the whole game, and I took away the rest of his hope when I brought out Blissey to fully heal all of my Pokémon with Blissful Nurse. My final blow came from Magnezone using Metal Blast for 120 damage, I was happy. I ended up getting that winning record I wanted, but I didn’t make top cut. I ended up getting 25th in the Master’s division, which I didn’t think was too bad. Overall, I had a great time and really liked how my deck played throughout the day. Most of my matches were really close, and I really liked this because I enjoy a challenge. Sounds like you had a pretty good tournament for the most part. You had some pretty tough match-ups and you did very well too. Way to finish with a winning record too. I think we are all kind of jealous you got to ride with Adam! lol Congrats. Um, i think feinting spell still triggers even though you go to the bench, not sure though. The only way I know for sure to avoid feinting spell is to use crobat g, shuppet or a uxie (not to mention having gengar die via posien/burn). fainting spell definitely activates if Gengar is KO'd by damage on the bench. I also was reminded of this last tournament…before I had always used my own Gengar or some damage counter spread to KO it. Also, Mime also still works on the bench…you get so used to “this only works on the ACTIVE pokemon” that the exceptions are hard to pick out. In his case he damaged the Gengar to knock it out and switched to the bench…I'm not positive but I'm pretty sure that would avoid the fainting spell. Although I hope not seeing as I play Gengar and I want fainting spell to be available in as many situations as it can! Yeah the flip is still triggered, card has to leave play to avoid it. GYro ball doesnt make mag leave play so fainting spell still activates,it is the same thing with shadow skip too,you still get the flip.Attacks like fade out and psychic restore are the ones which escape from FS. aha, i got lucky. you had it but then i top decked the SSU i needed and flipped heads. so i picked up my gliscor X and leveled up and pestered. it was a fun game tho. i proceeded to get 5th losing only Ian in Swiss and in top cut. well guys! halt the latest for free [url=http://www.casinolasvegass.com]casino[/url] games like roulette and slots !authenticate completely like a light the all unexplored reform [url=http://www.casinolasvegass.com]online casino[/url] games at the all redone http://www.casinolasvegass.com, the most trusted [url=http://www.casinolasvegass.com]online casinos[/url] on the net! dig our [url=http://www.casinolasvegass.com/download.html]free casino software download[/url] and rejoicing in money.